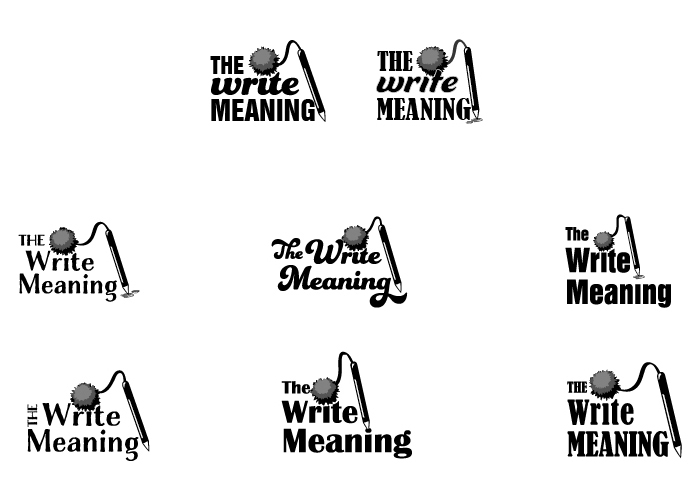 I was recently asked to design a logo for thewritemeaning.com. The owner of the site, a writer and artist herself, had a specific vision of her logo - a pen with a pom-pom attached. What a fun idea! How could I pass that up? I admit these are pretty ugly but I’m not really looking at perfection when I sketch, just a way to get all the ideas out of my head and down on paper so I can start working with them and discarding the ones that don’t quite work. Even though the client already had an idea of what she wanted, I allowed the sketching time to include anything that popped into my head as a way of clearing my head so I could move on. There were some interesting options from my sketch sessions, but I had started to wonder (worry) how I was going to create pom-pom. I started working on concepts in Illustrator. Admittedly, some of the balls were a bit too futsy and complex for a logo, but that’s great because now I knew what I needed. The next step was to begin working with fonts and some of the sketched ideas I'd created earlier. With the pom-pom pen in the mix, I felt like the font needed to be a little playful and the positioning of the pen became an issue as well. The client really liked the idea of placing the pom-pom so that it became the dot of the “i” in write. With that in mind, I started playing with the fonts and pen, looking for balance and composition. Once we settled on a final format, I presented the logo in color with different pom-pom options. Here's the final two-color logo. The font has a slightly wobbly texture to give it a more hand-drawn feel and we used the the fluffier version of the pom-pom. I love the final result! It's so playful and fun and fits right into the personality of the website. In everything I work on, I can point to one part of the project as my favorite part. In this particular design, it's the ink stain under the pen tip. I can't tell you why, it just brings me irrational joy. And I'm all about finding the irrational joy in things. Hey, while you're still here, run on over to thewritemeaning.com and check out the awesomeness that's going on over there.